Wednesday. 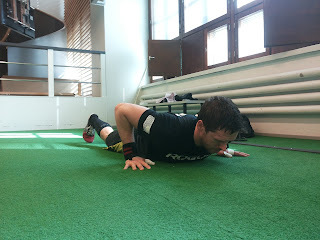 E2mom x 10min: 5 c&j (60kg) + 30 du's. E2mom x 10min: 5 c&j (60kg) + 8 burpee. I would appreciate if someone told me why my legs are killing me. I mean they are out of order for real. Hurts a lot in quads and they are sore when touching. It was gym time anyway, and program said clean and jerks. Didn't go heavy but instead it was heavy mentally in the form of sprints or intervals, however you wanna call it. Tough ones. My hand got torn two days ago on the muscle-ups / chest-to-bars so it had to be taped pretty roughly in order to stand the barbell work. No big deal eventually, tapes worked perfectly. 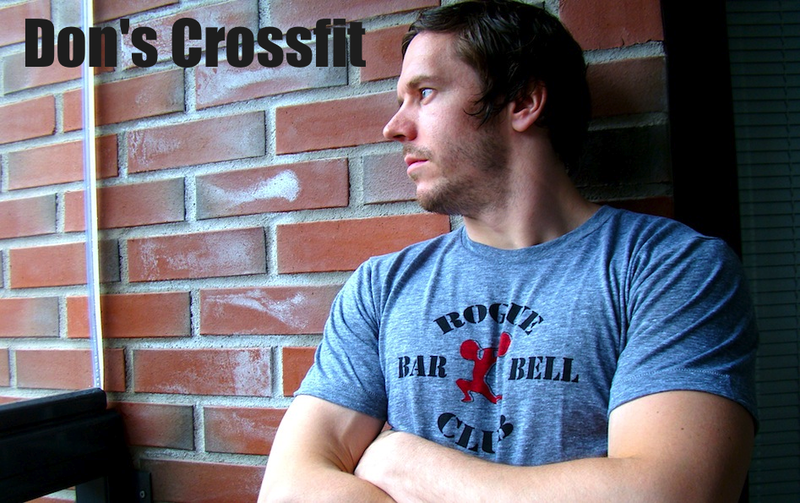 I wanted to breath hard, as I had worn Rogue's Engine shirt one. That's my metcon shirt, got to go fast heart beat those days. 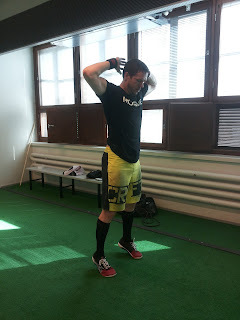 Played around with the bar with 40-60kg clean and jerks for a while, then tapped the clock running, and the idea was to go touch'n'go with the clean and jerks, and right after grab the jump rope and complete 30 double unders as fast as possible. Of course I had a trip on the set Pauliina took on video. Classic. This was either third or fourth interval. My legs were burning on those c&j's as my lower body was smashed already before opening the gym door. Shoulders felt good all the way but legs and breathing were taking hit throughout the session. After resting for about 3-4 minutes I repeated the system but changed double unders to burpees after discussing it with my mental coach Pauliina. We agreed on 8 burpees would be ideal so these would be something around 40 seconds per interval. And they actually were, same as with the double under versions. That was perfect leaving me over a minute to recover and I really needed that to get my heart beat down to a reasonable level. These were very nasty, and the body took a good beating on them. Had to walk the pain away for a while after each sprint but the time was enough to recovery still. Definitely not too much rest as it wasn't tempting to grab the bar for the next set. Enough to let the heart beat come down anyway. Try 'em out!